Still had to get my "fun fashion" fix. I drew these as I drew the others. Just going back and forth from "real to ideal!" So I've been intrigued by "real" people. As I take photos of crowds to gather reference of children I can't help but notice these characters in the crowds. I had to paint a few. We see these folks everyday. I usually draw more of a fashion type figure but I couldn't resist a few that stood out. Like this gal with her Chanel Bag. Maybe this is Coco's worst nightmare? Had to be a knockoff, right? But what a contradiction. Though these are relatively small paintings in size I like to see how much I can leave out and still have a story. I have tried translating these to large sizes and I think it works. So onward. This little figure painting I tried to keep to just two values and let color do the rest of the work. This is a "High Value Key" painting. Also reduced to basically two values but I brought up the shadow values to a "4" which moved all the information in the sunlight up to the ranges of "1 and 2". Just trying to establish the shadow and light pattern then add some ambient light color along with some reflected light color and I don't thing I need "eyelashes." Experimented with this one. You know that guideline: "the lightest area in my shadow is still darker than the darkest area in my light." Well I follow that religiously when painting objects illuminated with a strong light source. I had a highly respected instructor say that "even if a reflected light seems lighter than something in light, I paint it the same value or a bit darker." 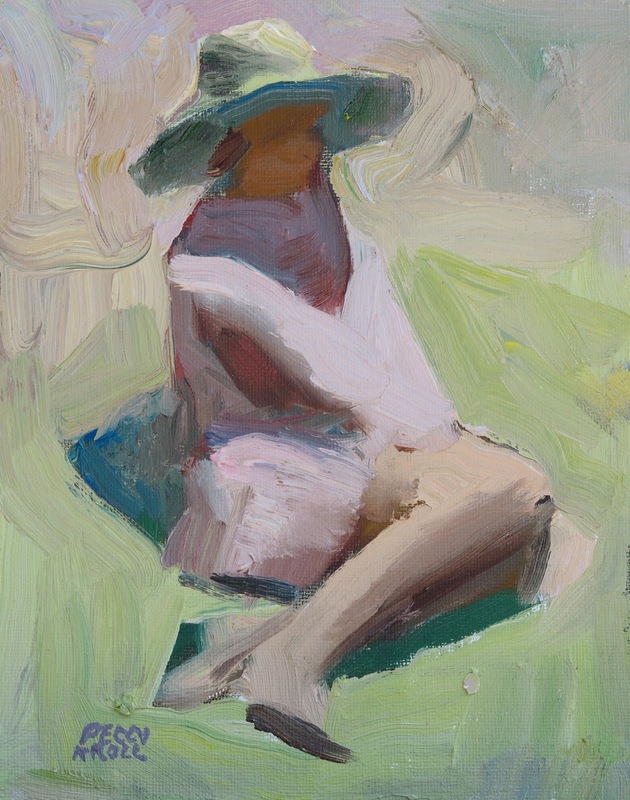 So here I tried to keep the pink dress and hat in the shadow the same value or no lighter than the green grass in light. I think it worked. One corner of my world. This is a glimpse of one corner of our studio. I have one half and Ray has the other half. This also shows a larger painting I've been working on. Did I mention I am trying to write a book? I've already decided to change the format. I am going to write "Recipe Books" for each fundamental. They will be volumes and hopefully not overwhelming like one large book trying to cover everything. I am concentrating on the "Value/Tone" volume right now. And am having so much fun just going back to basics. Here are some examples of what will be included. I know this one shows some color but the volume on Value will mostly be done in Black and White. Just wanted to translate a few images. Upper right of woman watering her flowers is simply to show what is illuminated by the sun and what isn't. I used a gray and a tint of a green. Simple. I forgot to include in this post the image I am working from. That will be in the book. It is an image of my daughter, Mary, examining the rose bush in our front yard. Lower left is my drawing style. Lower right is just simply stating what is in light which categorizes the rest to shadow. That's one of the most important things I need to know right off the bat! What kind of light am I painting in! And what's in it and what's not! The top two are variations on the plan. I prefer the top right. I think it will make a simpler read from a distance. I just completed a workshop at our own studio in Angels Camp, CA. This was a quick demo I did to demonstrate our first exercise. This was figuring out my value pattern. Did a few adjustments with the one in color. This is a cosmetic piece I did. This will hang in my sister's and her husband's business office. They own their own distribution company called "Style Garage." They did an incredible job with the commercial building they bought and renovated.